Hirshfield’s offers one of the largest selections of blinds, shades, draperies, bedding, shutters, and hardware available in the Midwest — Click on a category to learn more! Window dressings are central to a room’s character and draperies add to its charm. Custom Draperies and Side Panels can be made to be pleated, puddled, tied, or even all three at once. 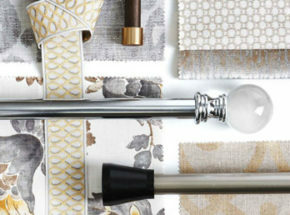 Custom window treatments are not complete without custom hardware. Choose from a variety of finishes, material, and styles to make your custom treatments stand out.